Cacao is a tropical tree native to Central and South America. Its fruit is best known as the main ingredient in chocolate, though it is increasingly being consumed for its nutritional value as well as its taste. Green Origins Cacao is typically grown by local cooperatives. The green pods containing the Cacao beans are hand picked. The flesh surrounding the beans is allowed to ferment away, which enhances the bean’s unique flavour. The beans are then broken into small pieces - or nibs - which are ground into a paste that is pressed to extract the butter. 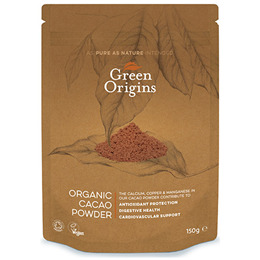 Organic Cacao powder from South America. Take 2-3 tablespoons per day. Cacao powder can be added to hot drinks and smoothies or used as a cooking ingredient, including for baking and making chocolate. Do not exceed the suggested use. Below are reviews of Green Origins Organic Cacao Powder - 150g by bodykind customers. If you have tried this product we'd love to hear what you think so please leave a review. Cacao is a tropical tree native to Central and South America. Its fruit is best known as the main ingredient in chocolate, although it is increasingly being consumed for its nutritional value as well as its taste.